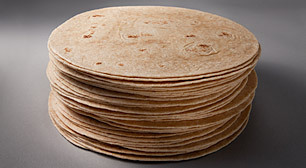 Made with 100% whole grains, our 6” whole wheat tortilla is a great option for menus that require a healthier perspective. Works great for tacos and fajitas. Whole Wheat Flour, Water, Vegetable Shortening (Interesterified Soybean Oil, Fully Hydrogenated Soybean Oil), Contains 2% or less of the Following: Sugar, Salt, Baking Powder (Sodium Bicarbonate, Corn Starch, Sodium Aluminum Sulfate, Calcium Sulfate, Monocalcium Phosphate), Vital Wheat Gluten, Monoglycerides, Preservative (Potassium Sorbate, Calcium Propionate and/or Sodium Propionate), Fumaric Acid, Dough Conditioner (Sodium Metabisulfite, Corn Starch, Microcrystalline Cellulose, Dicalcium Phosphate). Contains Wheat.